Carbon materials of either the nano-sizes or nano-structures are referred to nanocarbons, which from buckminsterfullerene (C60) discovered in 1985 to recent graphenes have attracted great attention of scientists and engineers in the wide fields of science and technology. 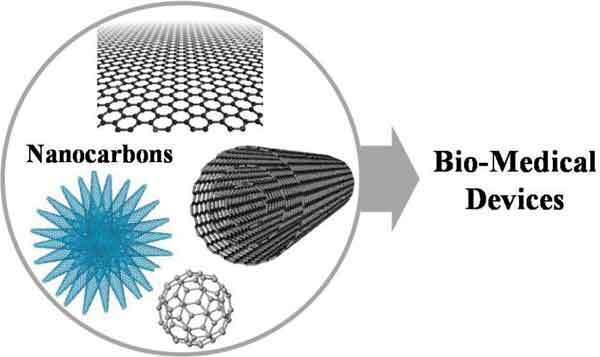 Here we briefly describe nanocarbons such as graphene and carbon nanotubes (CNTs) including carbon nanofibers (CNFs) and carbon nanohorns (CNHs) with highlights on the emergence of their applications in bio-medical devices. Application, bio-compatibility, bio-medical device, carbon nanofiber, carbon nanohorn, carbon nanotubes, fullerene, graphene, nanocarbon, toxicity. CAS Key Laboratory of Design and Assembly of Functional Nanostructures, FJIRSM, Chinese Academy of Sciences (CAS), Fuzhou, Fujian 350002, China.